Kitchen is one of the places, where most of the time is spent. For women, it is always a cumbersome messy room while very few treat it as an excitement. The real reason we repel kitchen is the hard chores that we encounter. However, there are few kitchen hacks that every woman has to know to make your workplace pretty easier. These kitchen hacks are really a great time saver for many. Peeling garlic can be done easier by placing them in a container and shaking it rigorously. This will separate the flakes from garlic. Easy and simple. Do you need fresh and neatly sliced potatoes for your dish? You can use an apple cutter for this purpose. The result is that easy. Cooking fish with lemons can increase the flavor of it, while grilling. Peel boiled eggs easier. Add ½ a teaspoon of baking soda into the hot water while boiling the egg. This will help in peeling it easier. You can make shaped eggs using cookie cutters. These can really be an attractive recipe yet a simple and easy one. Placing herbs in refrigerator is not always best as it might get spoiled soon. Alternatively, you can freeze mint leaves or any fresh herbs in freezer plate. All you need to do is place them with olive oil in the plate. Use the frozen oil mixed herb cubes into your dish whenever needed. Are you one who always mess-up with boiling milk? This is common and here is a simple way to stop it from spilling over. Place a wooden spoon over the pan of milk while it is boiling. This will prevent spill over during boilage. Ultimately, you can avoid a huge mess afterward. 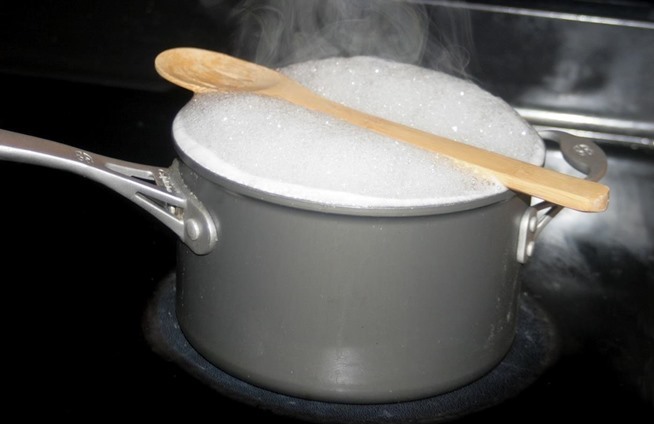 This is because wooden spoon pops the bubbles in the boiling milk, as well as absorbs the moisture. Metals spoons get heat quicker and so it won’t work the same way. If you need clear ice cubes for your pitcher or fruit immersed ice cube, then here is the trick. 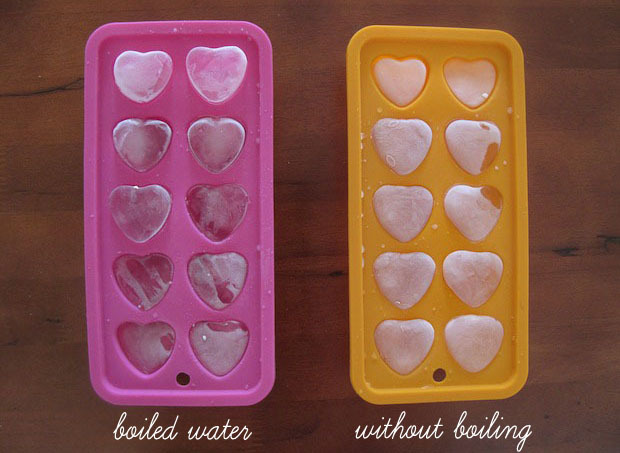 You have to boil filtered water and then freeze it. The science behind this is that eliminating the dissolve air in the water and decompressing minerals in it will give a crystal clear ice cube instead of a cloudy one. If you need to ripen bananas faster, you can keep them in oven. You can make them ripe in just less than an hour or so. You might find it too black but when you peel, it will be the right – perfect ripen. You can use them for baking or any recipes that needs ripen bananas. Here is a simple DIY veggie wash. Those sprays at market can be too expensive as well as with chemical compounds. Usually, cleaning with vinegar is a normal method. However, you can try this alternative as well. Just use a spray bottle by filling it half with normal water and add a table spoon lemon juice and baking soda. Shake well until it bubbles and fizzes a bit. Use it to wash your fruits and veggies. It is common for avocados to turn brown quickly after it is cut. To prevent this, you can pour some raw apple cider vinegar over the cut part of the avocado. This will keep the fruit fresh and green. Additionally, if you are keeping avocados in refrigerator, you can place a piece of onion along with it. This keeps it fresh for two days. These are few of the kitchen hacks that can be used in everyday kitchen chores. Stay tuned to our blog and we keep updating with new hacks everytime. I love the idea of freezing the herbs. Thats nice. Try it out doreen.